When seeking information on starting a freight brokerage, look for websites that are packed with it. Look for a diversity of ways the author wants to communicate with you. For example, you would like to see not only written eBooks but videos and audios as well. In our website, you can easily drill down to scan topics and then open up topics that you might be interested in. For example, there are tabs at the top such as Training Options, Resources, Veteran Discount, Certificates/Authority and About. Training Options - most people train Live in El Paso, over the telephone and Internet or with the home study. Even the Home Page has a wealth of knowledge. Explore this website, www.atexfbt.com and let John know if you have questions OR if you are ready to get started. Nearly everyday, I see ads by freight brokers seeking agents. The "problem", if you are new to this industry, is that these brokers want experience and those agents with a following. That's bad news for newbies. I see ads from newbies as well, seeking brokers who will "take them under their wings". Some newbies are even willing to work for next to nothing just to learn the ropes. For the most part, these newbies are not going to find a broker to work under. I wish I could help; what I CAN do is train you to become a fully self-employed broker. You would be building YOUR business instead of some one else's. Training has become more and more accessible over the past two decades as the Internet has exploded with all sorts of options. Materials that can be reviewed over and over and over again. The materials are detailed and comprehensive and in addition to the the basic training manual, clients have 40 handouts and 29 video presentations. Some of the handouts will be used in the brokerage and the client only needs to modify them with the client's information. 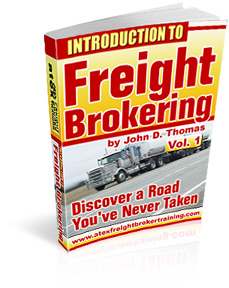 There are numerous training programs on how to become a freight broker. Some are low-cost, others several thousand dollars. In this industry, you normally get what you pay for. If you have decided that brokering is for you, go with the best. Consider Atex Freight Broker Training. Train from someone who has "been there, done that". Go with a trainer with over 25 years working with small business start-ups. Go with with some one who will give you support long after formal training. Go with some one who will get involved with YOUR goals. Go with some one who provides personal interaction like no other trainer. Go below to download the F.ree eBook: "Introduction to Freight Brokering". Nearly 10,000 people have found this valuable resource helpful in learning about the industry as well as the type of quality content you can expect from training. Every now and then, a person calls or emails and wants to know when classes or school starts. They want to know when to register. These individuals most likely learn about our training from YouTube videos. And in these videos, I don't explain the fact that there is no school or no set classes. Our freight broker training is conducted live in El Paso at dates and times that YOU choose. Likewise, training over the telephone and Internet is scheduled at dates and times that fit YOUR schedule. It's called flexibility. Evening training as well as durng the day adds another dimension to being flexible. I receive many phone calls and emails. A good number of callers and emailers have asked for live training in their area out east. I'm exploring this. To keep up to date on things, you may subscribe to my blog by going to the sign-up box in the upper right-hand corner. You will get updates when I post a new blog comment. You won't get spammed and you can cancel at any time. Every month the government comes out with their Jobs Report and this month was a disappointment for everyone. There were 162,000 new jobs this month and last month, I believe, there were 192,000. I believe experts talk about needing many more than 200,000 each month to put a kick into consumer spending. Housing and autos have rebounded nicely. But new jobs remain lackluster. Many unemployed individuals have and are realizing more and more that there is more risk and uncertainty in waiting for their job to open than there is with starting their own business. The truth is, many jobs simply will not return. A headline this morning asks, "Are we becoming a nation of hamburger flippers"? There is a big demand for retail sales and restaurnat workers. But these are low paying jobs and probably will remain low paying for many years. You may either need to obtain a skill that is desired by employers or you need to think about starting your own business. I have a program that will have you start calling on customers in about 30 days. Is it easy? Heck no. Can you start making a living in a couple of months? Most likely not. But you CAN start building a little empire one customer at a time and you can't get fired. You can only quit and some do without having the proper preparation. Some training schools get some type of accreditation for their course work, usually through the State. While there is nothing wrong with this, it can be misleading. Accreditation may or may not involve actual, real-life freight broker experience. There is nothing like getting trained from someone who has "been there, done that"; there is nothing like getting trained from someone who has had to bang their head up against the wall a time or two; there is nothing like getting trained from someone who may have had to sweat a time or two, trying to make a truck payment on time. Accreditation in itself, as mentioned above, is not a bad thing. But if that accreditation is not coupled with someone who has had real life freight broker experience, you may be getting short-changed or you may be getting more theoretical information rather than information based upon actual happenings. Find out as much as you can before you set out to spend a lot of money on training. Go to www.atexfreightbrokertraining.com and scroll to the botton til you see a link called "In a Nutshell" Click on it and you will find a wealth of free or low-cost information. Before I got into freight brokering myself, I was so dumb, I could not ask an intelligent question. Maybe you can identify with this. Folks, there are all sorts of vendors preying on people like me (and maybe some of you). Every so often I get a call and the person tells me of other trainers who will give a list of shipper names and phone numbers. So, let's stop and think about this: if this list is going out to who knows how many others, these wanna be freight brokers end up calling on the same shippers over and over and over again. Not good! There are a lot of decisions to be made when getting organzed with your freight brokerage. The last thing you need is for someone to try and sell you something that you don't really need. Here at Atex Freight Broker Training, Inc, we pride ourselves on giving you the straight scoop. For example, you will have a choice of using several load boards from a large selection. It is essential that, starting out, you have at least two good load boards. The problems is, you don't need a "sales pitch" when deciding what features you need. You need the straight scoop. We are objective when talking about the load boards in our training. This is extremely important. We go into detail with several leading load boards and point out what features can be obtained free of charge elsewhere.